The DET2/3 is a robust and compact automatic earth (ground) test instrument designed to measure earth electrode resistance and soil resistivity. 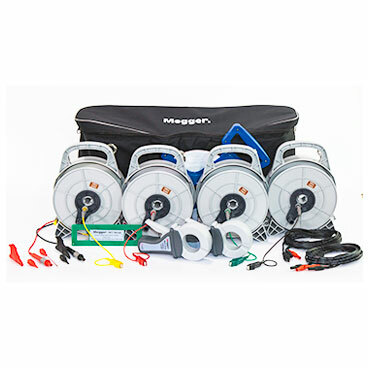 For use on large or more complex earth systems, which include communications earth systems and difficult test environments, it can be used to test in accordance with BS 7430 (earthing / grounding), BS-EN-62305 (Lightning Protection), BS-EN-50122-1 (Railway Applications), and IEEE Standard 81. Test frequency, test current and filtering can be quickly and easily adjusted so that adverse conditions, which can influence the test, can be overcome, and a wide band of test current frequencies, with a resolution of 0.5 Hz, can be used to eliminate errors caused by noise in the earth. With its microprocessor controlled system it provides a flexible and ‘user-friendly’ approach to earth tests by the provision of excellent error detection capabilities and full test information shown on a large colour display. The DET2/3 can provide a live trace of its measurements, which graphically shows the amount of noise from the system under test - a powerful diagnostic tool for the expert earth (ground) test engineer. 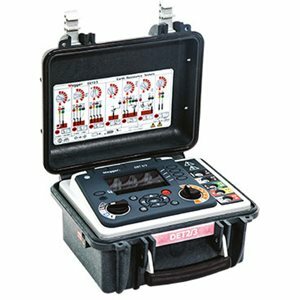 The DET2/3 also includes an automatic frequency selection feature that scans for frequencies with the lowest noise level and then runs a test at that frequency. The selected test current frequency, test current level and the increased filtering option are stored in memory for use in subsequent tests. Use of the latest processors and a large internal memory allows for immediate calculations of resistivity (Wenner or Schlumberger method) and the ability to save a complete days’ worth of test results. Test result data can be downloaded directly through a USB flash drive or straight to a Windows PC running PowerDB™ software. Copy update.bin to the root of a USB stick and follow the instructions below. Please check the version number before and after the update.